Baptist prayer meetings have been called "organ recitals," because we pray for this person's lungs, another's kidneys, someone's pancreas——you get the idea! We spend more time praying for sick saints than we do for lost souls. Perhaps, the most pointed way to say it is how someone once said it to me, "We spend more time praying sick saints out of heaven than we do lost souls out of hell." It's not that we shouldn't pray for the healing of our sick brothers and sisters in Christ; it's just that we shouldn't do it to the exclusion of praying for the salvation of lost souls. Years ago, I asked my wife how she prayed for the lost. She answered, "I ask God to save them." "There must be more to it," I insisted. She replied, "It works for me." I assume that every sincere Christian prays for the salvation of lost souls. Like my wife, most may feel that their present prayers for lost souls are sufficient. Far be it from me to suggest otherwise. Unlike my wife, and perhaps most other Christians, I've often felt that my prayers for lost souls fall short. I must admit that the feeling of falling short is frequently felt by me whenever I fall upon my knees. Due to my suspicion of inadequacy and inefficiency in my prayers for lost souls, I once conducted a rather intense study of the Scriptures in regards to how to pray for the salvation of others. 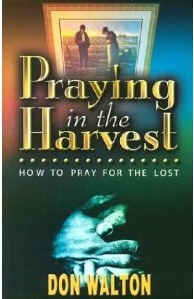 This study resulted in a book, Praying in the Harvest: How to Pray for the Lost. The book points you to the multifaceted miracle of salvation. By doing so, it will hopefully drive you to your knees. First, in adoration of Christ, who snatched you as a brand from the fire with His loving and gracious nail-scarred hand. Second, in intercession for the lost, whose dire and desperate plight is plainly presented on the book's pages. Before the book was published, a friend, after reading a draft of the manuscript, suggested a change in title. He felt that a new title was warranted because the book dealt with far more than just the titled subject. Although I readily admit that the book is a serious study of our salvation in Christ, it retains its original title, thanks to the fact that my original intent is still intact. My aim in writing this book was to aid people in their prayers for the lost. What better way to do so than by spreading out before you all of the scriptural particulars involved in the salvation of a soul. By zeroing in on the particulars we cannot help but make our prayers for lost souls more effectual. Below you will find 30 days of devotions on prayer for the lost. These devotions are taken from my book Praying in the Harvest: How to Pray for the Lost. You have the author's permission to print and freely distribute to others this entire manuscript or any portion thereof. If you would like to help us continue to offer complimentary resources, like Praying in the Harvest, you can make a tax-deductible donation to "Time For Truth Ministries." All contributions should be mailed to: Time For Truth, P. O. Box 811, Townsend, TN 37882.